CareZone is a new medical app for travelers, seniors, for children and for families that need to track multiple prescriptions, doctors instructions, and allow shared users to also have access to that information – Very important when a family member is overseas. 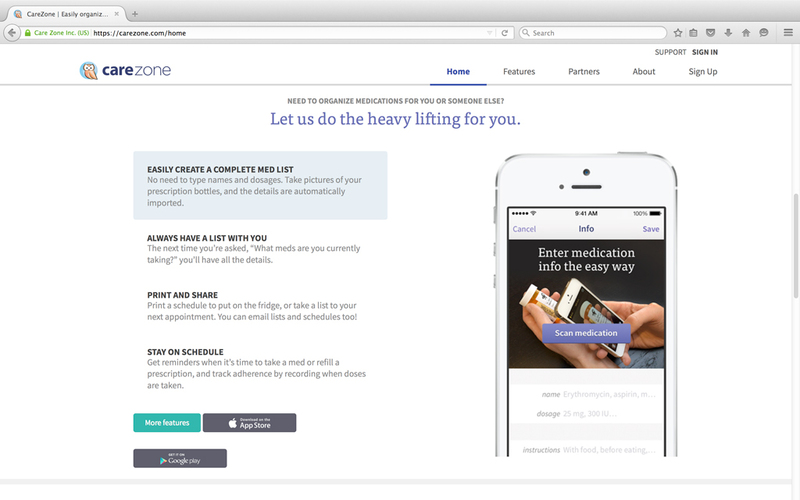 CareZone, available on both Apple iOS and Google Android devices lists prescriptions and usage, as well as keeps track of any instructions the doctor may have given you, and lists any important information related to your health. It also allows “helpers” (such as a spouse or adult child) to have access to your information in an emergency. You can also simply scan in medications and prescriptions. The app has been featured or reviewed on the WSJ, Time Magazine, CNN, the New York Times, and USA Today to name a few. It features medication tracking, keeping a list of all medications, dosages, purpose, prescribing physician, pharmacy, RX number and more. 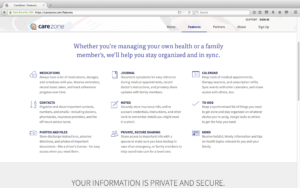 And has a neat “file storage service” so that you can share files with “helpers” (loved ones about your or a loved one’s care anywhere in the world). You can also use it to keep track of elderly parents back home in the USA or loved ones after they have been diagnosed, treated, or discharged. The notes section also allows you to track insurance information, who you spoke with, claims, and any other pertinent information to help you say organized and to help a loved one if you are not able to speak for yourself (i.e. are admitted to a hospital and are unconscious). You do need to make sure you set up this feature and permissions for each person in the family before anything were to happen. Document symptoms for easy reference during medical appointments, record doctor’s instructions, and privately share updates with family members. We like CareZone and are featuring it on our top recommended medical apps for travelers page (Essential Medical Apps for Travel) because we feel it fills an important need, especially for those caring for young children or older parents and needing to keep up to date information, share information and have that medical information and prescriptions available in case of emergencies or in order to fill prescriptions or deal with international health insurance claims. If you have an international health insurance policy and use prescription drugs (either sent over from the USA, taken with you in luggage, or filled locally), or need to track care or treatment for yourself or a loved one, you may want to consider the Carezone app for Android or Apple iOS. “If you’re caring for someone in need, you’ve likely faced the same challenges we’ve all faced – a desire to use modern Internet tools to stay organized and coordinated, with a lingering concern around where that information goes, who sees it and how it might be used in the future. We wanted to address those concerns up front. 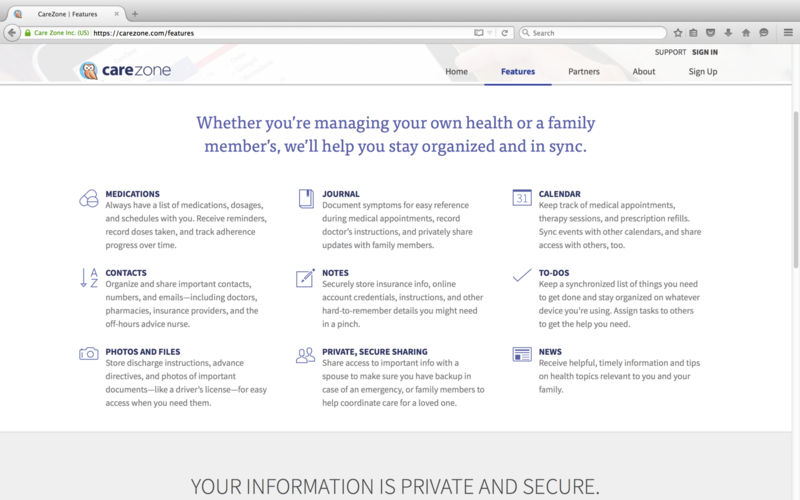 First, CareZone is built on the assumption you’re caring for someone else, on whose behalf you might keep a journal, archive documents, manage information, or track medicines. We all know that caring for someone creates an endless stream of information — CareZone helps put you in control. Second, CareZone’s default privacy setting is simple: only you can see what’s in your account. No one else. If you want to extend access to others, like your spouse, extended family, or an emergency response team, you make (and can revoke) that decision explicitly.